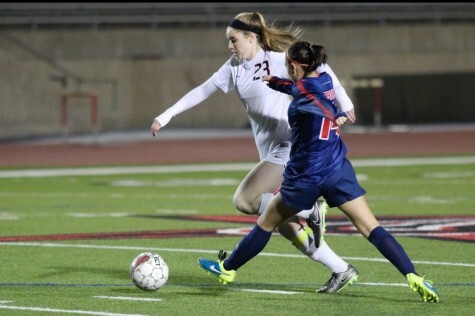 During the first half of Friday night’s game against Richland, Coppell High School senior Ashleigh Little dribbles the ball down the field as she looks to pass the ball to CHS junior Tori Teffeteller. 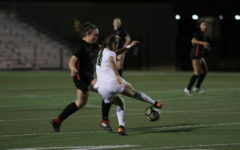 After keeping the lead the entire game, Coppell ended the night with an 8-0 victory over Richland. 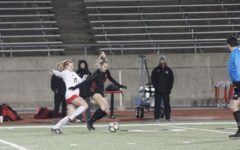 As the temperature was dropping and stands were filling with people of all ages, the Coppell Cowgirls were warming up for what would be a 8-0 win, defeating the Richland Rebels with flying colors. 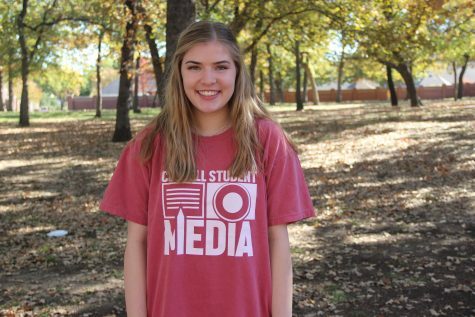 The Cowgirls kicked off the match with an immediate goal from junior Maddie Weber, setting the Cowgirls up with a positive mindset throughout rest of the game. With approximately 29 minutes left in the first half, junior Tori Teffeteller follows Weber’s lead and scores the second goal of the night. After two more goals were scored by juniors Baylee Hux and Sarah Houchin, Teffeteller secures another goal for the Cowgirls, ending the first half with a score of 6-0. 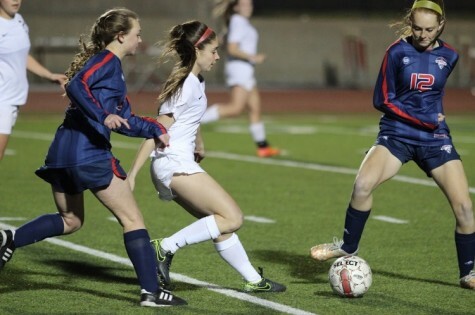 Coppell High School freshman Nicole Henry dodges two oncoming Richland defenders during the second half of Friday night’s game. 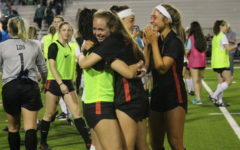 The Coppell Cowgirls defeated the Richland Rebels with a final score of 8-0 at Buddy Echols Field. 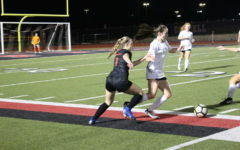 With 29:45 left in the second half, the Rebels attempted to steal the ball from junior Sarah Houchin, but did not prevail as Houchin dodged the attack and continued down the field, scoring the Cowgirls’ seventh goal with astonishing speed. As the number of goals increased, so did the Cowgirls’ spirit and intensity. Right after a corner kick from senior Emma Jett, senior Maddie Speanburg fires the final shot of the night, earning the Cowgirls’ eighth goal of the game. 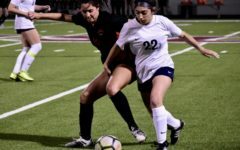 The constant high defensive pressure and intense offensive plays from the Cowgirls proved to be too much for Richland to handle as they did not get a single ball into the goal. “We played really well and we finished a lot of opportunities, which is a good, positive thing for us. Some of the things we really struggled with in the past seemed to improve today. We set our minds to our goals and we executed,” Coppell coach Ryan Dunlevy said. 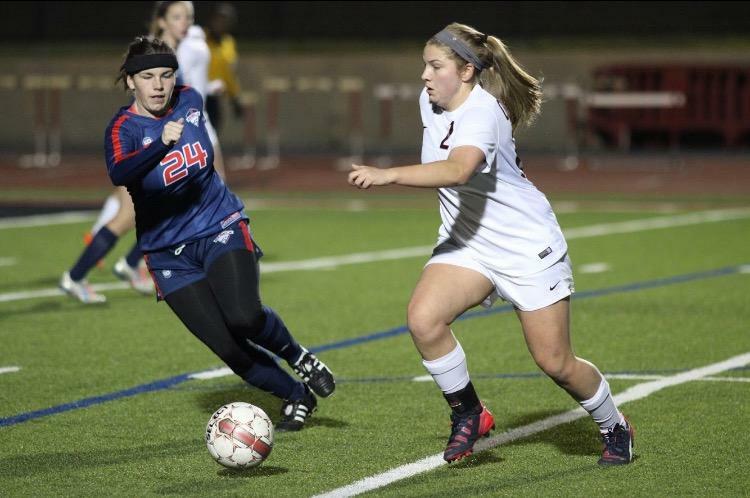 Coppell High School junior Sarah Houchin runs the ball down the field while a Richland defender chases after her as the first half of Friday night’s game comes to a close. Coppell constantly held the lead over Richland, finishing the game with a score of 8-0 at Buddy Echols Field. Even though the Cowgirls did not let in a single shot from the Rebels, there is always room for improvement.